On Tuesday, former Donald Trump campaign manager Corey Lewandowski displayed a shocking lack of humanity when he went on Fox News and responded to a story about a 10-year-old migrant girl with Down Syndrome being taken away from her mother at a border facility by saying, “womp womp” in a mocking tone. 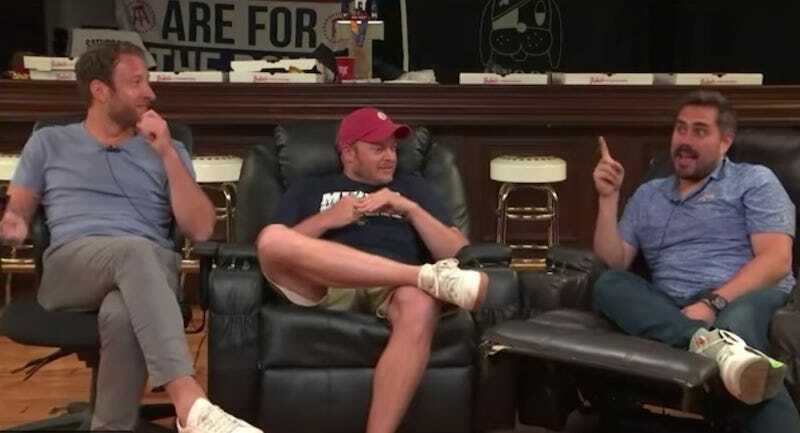 A day later, three Barstool Sports employees discussed Lewandowski’s comments, and somehow managed to embarrass themselves in almost equal measure. The fact that three guys from Barstool, whose empathy receptors have been deadened by years spent punching their buddies in the nuts and running each other over with golf carts, were able to find some humor in the moment is not particularly surprising or remarkable. What is wild is that they then invited their colleague Liz Gonzales, a first-generation Mexican-American, onto the set to talk about whether Lewandowski’s comment was indeed funny. If they were seeking some validation from Gonzales, they didn’t get it. “I totally disagree. I think it’s shameful this is where we are,” she said. None of those really seemed to do the trick, and the segment eventually ended with an awkward transition to a discussion about Phil Mickelson.